You're a dectective, and you've got to clean to town up and get rid of the mob. Point and shoot. 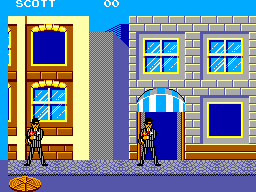 There are driving sequences where you've got to shoot at the gangster's car, a couple treks through downtown, shooting up a saloon, a night club and at the docks. In between levels you get to shoot out a brick wall to reveal a bonus. The levels are great. Gangsters who have been shot turn into angels. If you shoot the angels, they fall and disappear, and give you points. Every level has something you can shoot at besides the gangsters. The windows on the car in the first level can be shot out just for fun. 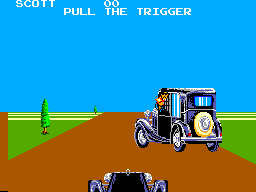 Shooting out the tires of the car offers big points, and causes a replacement car to approach from ahead of you. 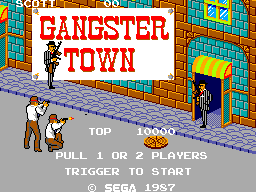 The windows downtown all break when you shoot them, and you can crush gangsters by shooting down building signs. The saloon offers breakable bottles and rats, and the night club lets you wreck the drumset. Every level except the first one has a medallion hidden in a wall somewhere. Once it's shot out, you have to shoot it again to replenish your health. You're health also gets replenished and expanded between levels based on your shooting accuracy. So blowing away all the bottles in the saloon will cost you. The game is pretty tough when you play it alone, but obviously becomes much easier when you have a partner to help you out. The one marvellous thing about this game is that it shows you where your shot hit on the screen. I used to find this awesome as Safari Hunt didn't do this. I'd say the graphics are pretty damn solid for the year they came out. The gangsters have their classic pinstripe suits, their car is well drawn and shaded. The backgrounds offer great details to look at if you have a second to spare. The colours are bright, so you won't get bored looking at this game. The music is pretty good. The level toons are catchy, and some of the inbetween music is annoying. None of it will win any awards, but it won'd drive you crazy either. The sounds effects are average; typical Master System bleeps and bloops. The controls are only as good as your aim, or on how accurate your aging Light Phaser is. Basically, when you pull the trigger, you see where you shot on the screen. I found this to be a game I could play over and over. There is the challenge on improving your shooting accuracy, or trying to break every saloon bottle, or finding every hidden medallion. Anyone who owns a Master System with a Light Phaser should own this game. It's one of my all-time favourite SMS games out there. Get it...NOW!! !